Food preparation is not the forte’ of the skeptical cardiologist. However, a “heart-healthy” snack he created yesterday is generating such a buzz in the Pearson kitchen that he felt compelled to share it. One head of cauliflower, raw, uncooked and broken up into florets . Mine was organic from Whole Foods. Peanut butter. Mine was ground from peanuts a week earlier at Whole Foods. It takes about 2 minutes to convert a head of cauliflower into bite size pieces. 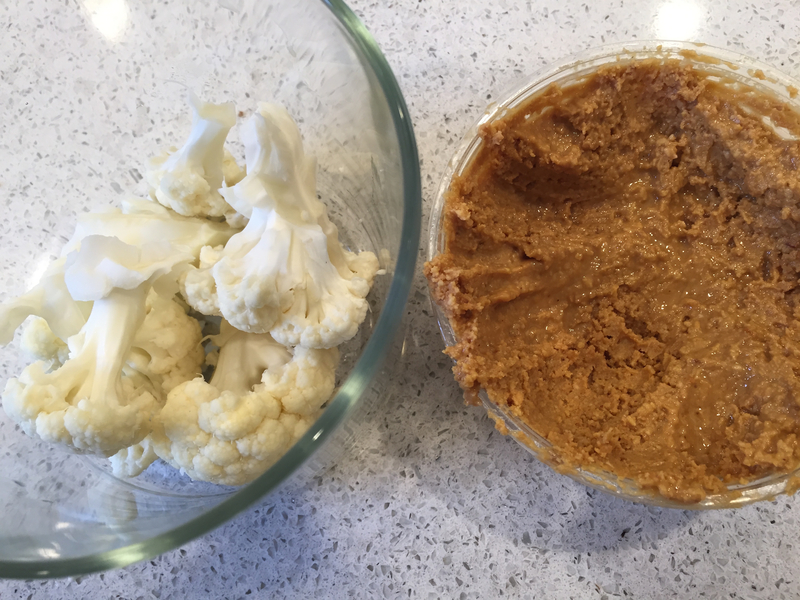 Be sure to leave the stems intact because they can be used as “handles”, if you will, to dip the cauliflower pieces into the peanut butter. My friend Charles had his doubts initially but became a huge fan after having a few bites. His skepticism evolved into a passionate belief in the snacks. 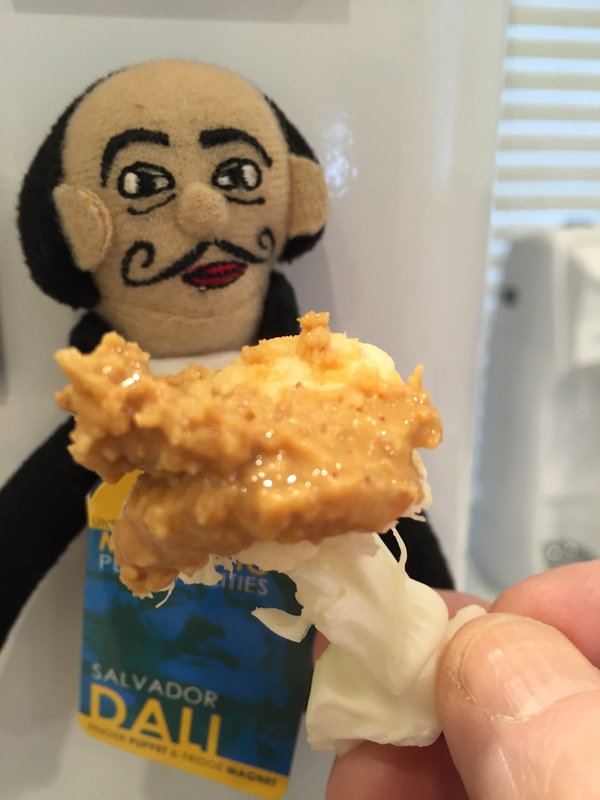 Salvador was entranced and made vertiginous by the phantasmagoria of colors, textures and shapes that emerged from the combination of cauliflower and peanut butter. This snack, which I have dubbed a Darwin Dali-ght ©, combines two heart healthy ingredients. 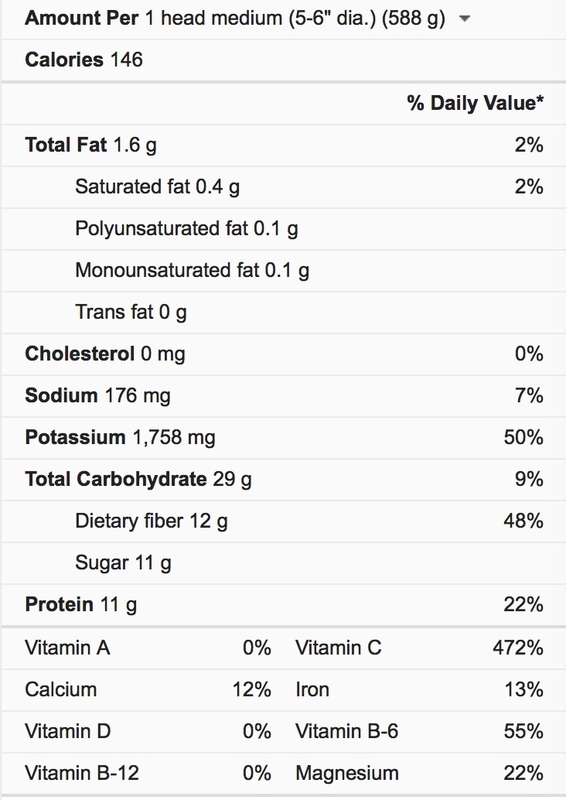 472% of the recommended daily allowance of Vitamin C.
It has negligible amounts of cholesterol and fat (but we are no longer concerned about these) and 11 grams of sugar (it is not added sugar so this is OK). Some authors (such as the ubiquitous quack Mercola) have proclaimed it a superfood, going on and on about various antioxidants and obscure chemicals found in it that may have anti-inflammatory or anti-cancer properties but this is all speculation. A whole head of cauliflower contains about 1800 mg of potassium which is 50% of the daily allowance. Depending on what source you consult you will see it listed as both low in potassium and high in potassium. Given that a 100 gram serving of cauliflower contains about 300 mg of potassium, I will be recommending it to my patients with low potassium and telling my patients with high potassium to stay away from it. Two tablespoons of peanut butter contain 3.3 grams of saturated fat and 12.3 grams of unsaturated fat. We don’t have to worry about these fats, they don’t contribute to obesity or heart disease (see here). 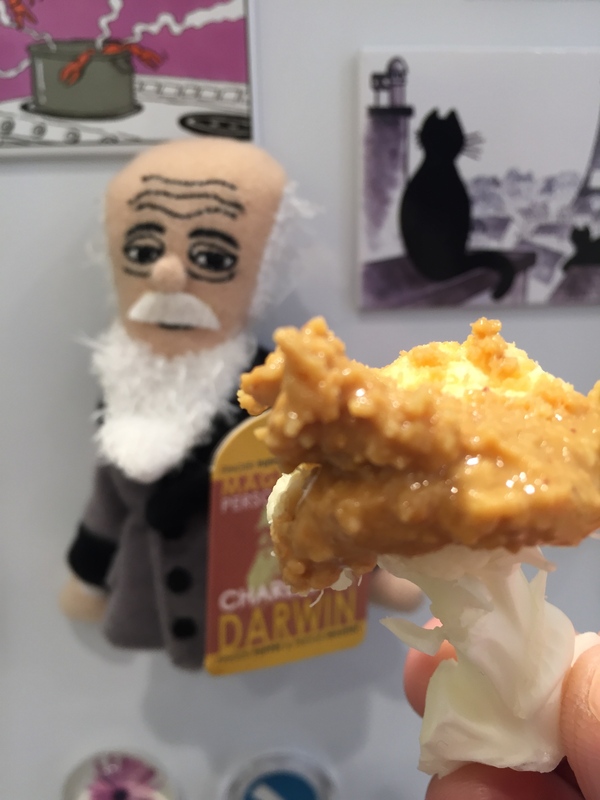 The fat in the peanut butter adds to the satisfaction and feeling of fullness created by the Darwin Dali-ght ©. Peanut butter is also full of great antioxidants and potassium. The bandmates of the skeptical cardiologist (including the son and youngest daughter of the skeptical cardiologist) dug into some Darwin Dali-ghts after yesterday’s jam session and were pleasantly surprised at how tasty and satisfying these heart-healthy concoctions are. Nota Bene: I have discovered today how to make the © sign on a Mac keyboard (alt g). Also, please note, that I have not heavily researched whether this combination of foods has been created or copyrighted previously. Fascinating article Dr P. Such a tasty snack. Makes me want to rush out and get the ingredients to try it. Will any kind of peanut butter work do you think. Thank you for your comments. I don’t think there is enough evidence to proclaim omega-6 fatty acids or the ratio of omega-6 to omega-3 as the cause of atherosclerosis or Western chronic diseases. I looked at your reference and other publications from Bruce Lands, Ph.D. I’m surprised that reputable journals publish these writings as they are mostly his unsubstantiated ranting and ramblings about the dangers of omega-6. The other problem with peanuts is all the lectins. As we know, they are a legume, not a nut. Peanuts are definitely legumes botanically but in most dietary studies they are classified along with nuts and when they are separated out, the benefits of peanut consumption are similar to those of other nut consumption. Why are you worried about lectins?